The all-new Audi SQ5 is big on performance and luxury. It isn’t too often that I get a performance vehicle, but when one arrives, I rub my hands in delicious anticipation of the drive ahead. Most of my performance test models are coupes and sports cars, such as the Ford Mustang and Jaguar F-Type, or a hot sedan such as the Dodge Charger Hellcat. But now I’m starting to see “hotted up” utility vehicles, which makes sense as SUVs represent the fastest-growing segment. If you’ve followed me for long, you know my preference for cars and pickup trucks over everything else. Alas, the market shift means I’ve had to adjust and that requires testing an endless stream of crossovers and other people movers. 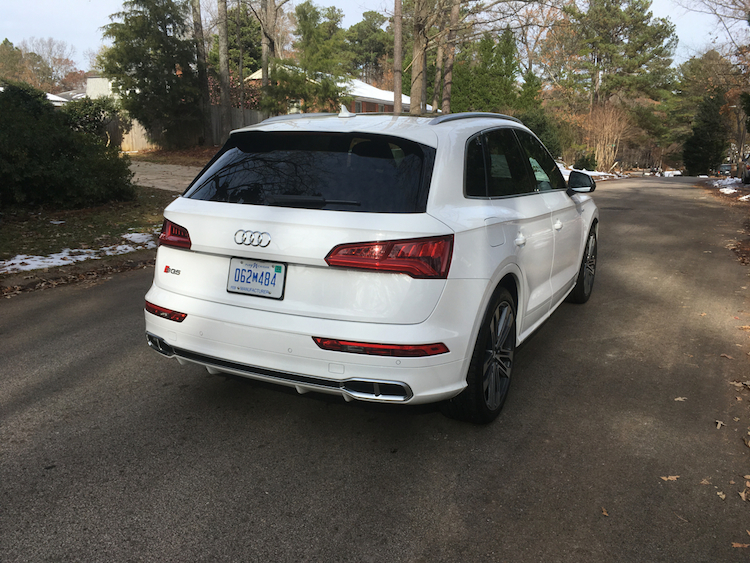 Happily, manufacturers understand that some customers still want performance and, to its credit, Audi is accommodating our need for speed with the SQ5. Based on the compact Q5 utility vehicle, the 2018 Audi SQ5 represents the performance side of the model line. It is the only Audi SUV line with a performance variant, with the latest-generation model introduced for the 2018 model year. The current version replaced the previous supercharger with a turbocharger, giving this model a noticeable boost in torque along with a slight improvement in fuel efficiency. This all-wheel-drive model is still powered by a 3.0-liter V6 engine paired with an eight-speed automatic transmission. Like other Audi models, this one is available in three trims: Premium ($53,395), Premium Plus ($59,195), and Prestige ($63,095). Our prices are for the 2019 model as this is the one you’ll most likely find on dealer lots at press time. You’ll find various package options for further customization, depending on the trim. For instance, the base model offers a Convenience Package ($1,500, keyless entry with push-button start, automatic dimming and power-folding side mirrors, driver’s memory seat, satellite radio, and Audi pre sense rear with side assist). The middle Premium Plus and top Prestige trims offer an S Sport Package ($3,000, red brake calipers, sport adaptive air suspension, sport rear differential). Also, a Black Optic Package ($600, 20-inch Anthracite wheels, summer performance tires, matte black roof rails, titanium black exterior trim). 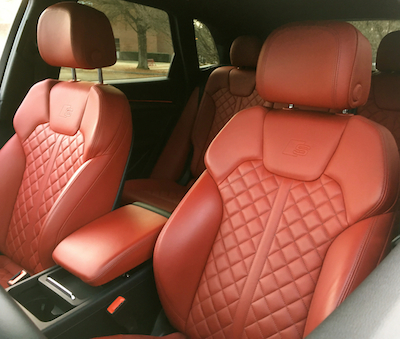 My Prestige test model had more than $8,000 in upgrades, including the S Sport Package, Driver Assistance Package ($1,800), Fine Nappa Leather Interior ($1,250), Dynamic Steering ($1,150), the 21-inch Wheel Package ($1,000) and Carbon Atlas inlays ($500). If I were to build one, I would start at the Premium Plus level. Then again, the Prestige trim brings in the banging audio system, the leather upgrade and the driver assistance package. Based on the crisp, elegant look of the Audi Q5, the SQ5 brings in its own styling elements. That said, the differences are not readily apparent, especially to those not familiar with the brand’s lineup. Beginning with the front fascia, the SQ5 has standard high-intensity density headlights or available LED lights. LED lights also fashion the rear. Special alloy wheels set this model apart and exterior badging is also unique to this trim. Inside, the changes are much more apparent, beginning with the fixed display screen on top of the center stack. In most other Audi models the screen retracts, while this one stays in place. This trim also comes with a three-spoke multifunction flat-bottom steering wheel with paddle shifters, diamond-stitched front sport seats, aluminum inlays, and aluminum touches. As for passenger comfort, tall passengers may find the rear seating area small. It is most suitable for two passengers, not three. 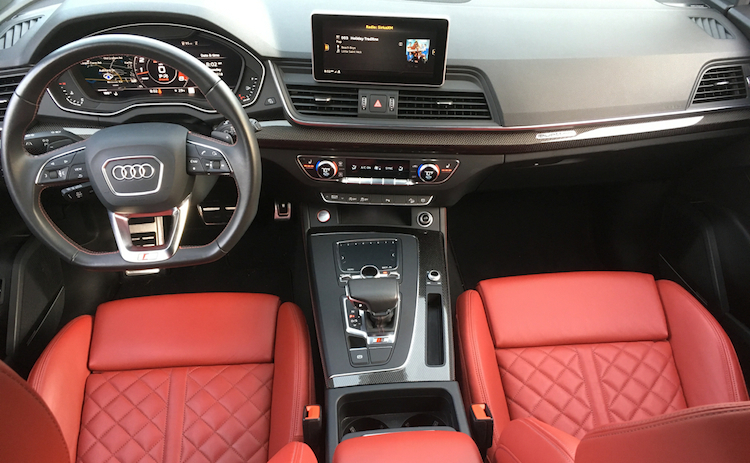 Audi loads the SQ5 with top equipment, including a virtual cockpit, a Bang & Olufsen sound system, 4G LTE technology, and Apple CarPlay and Google Android Auto smartphone integration. The cockpit display is a gem as it supplies a sport display mode, which brings the tachometer and speedometer to the front. As for driver assistance systems, Audi includes adaptive cruise control, an automatic emergency braking system, side assist with blind spot monitoring, rear cross traffic alert, and traffic jam assist. These are features which typically accompany top models such as the SQ5. The chief selling point for the Audi SQ5 is its performance. 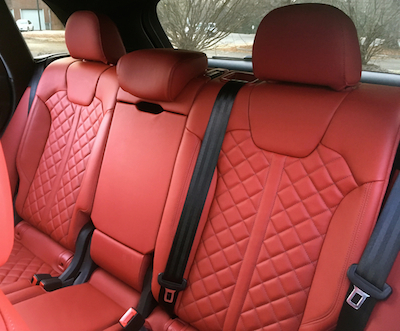 Sure, exterior and interior styling and amenities are important, as is technology and safety. But make no mistake about this: the only reason to consider the SQ5 over the standard Q5 is that you put a greater value on performance. 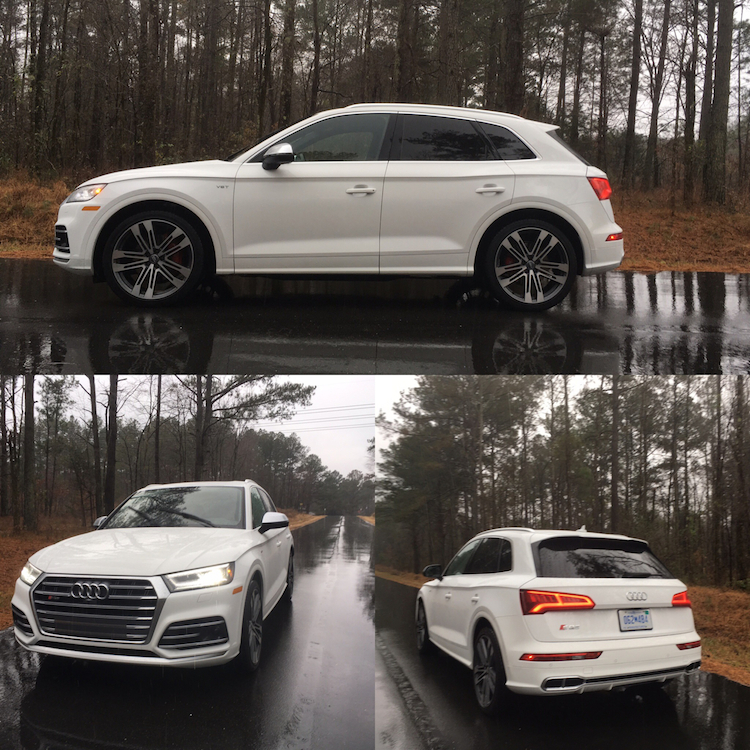 Happily, the 2018 SQ5 does not disappoint. In fact, it thrills — and for an SUV that’s no small matter. 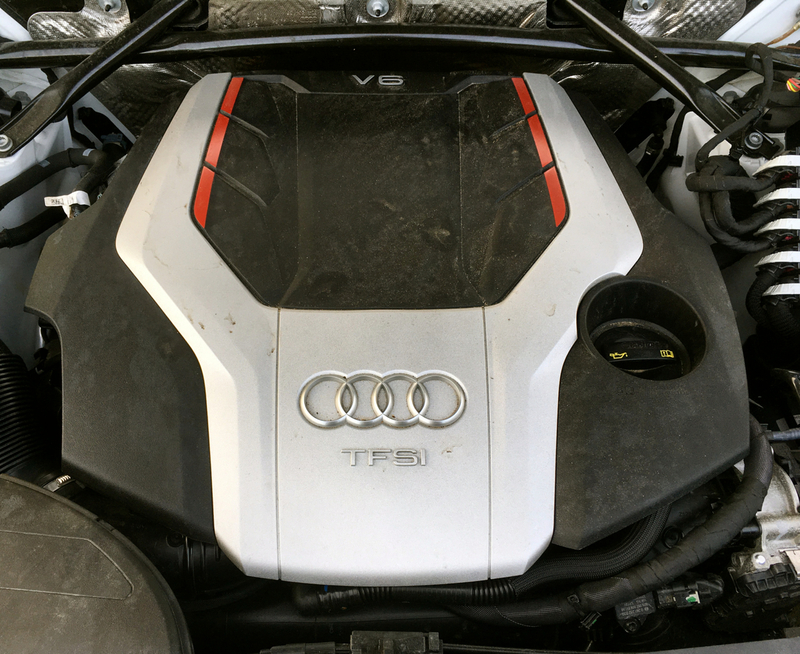 To begin, the SQ5 has a turbocharged 3.0-liter V6 engine with an output of 354 horsepower and 369 pound-feet of torque. While horsepower stays the same for the current model, you’ll notice a 23 pound-feet improvement in torque. That’s what happens when you swap out the previous supercharger for a turbocharger. Engage the ignition and a quiet rumble coarses through the SQ5’s body. Move the transmission into gear and step on the gas pedal, and the turbos quickly spool up. There is generous amounts of energy at hand and, thanks to low-end torque, it keeps on giving. Audi says this SUV runs the 0-60 mph sprint in about 5 seconds and that’s in line with what we experienced. Weighted steering supplies the connectivity to the road you want. This SUV shines on the straightaway, delivering robust power and much more when needed. On curvy roads the SQ5 acquits itself as it hangs with every twist and turn. Yes, some body roll is evident — that’s to be expected with any high-profile vehicle. Happily, the rolls do little to negate the fun. One nice touch with the SQ5 is the available rear mechanical limited-slip differential. It sends power to the outside wheels when cornering, which is what gives this SUV a planted feel. The air suspension system is another plus and it is adjustable. Here, ground clearance can lower to 7 inches from the standard 8.2 inches, for a closer connection to the road. Again, this is no sports car, but the performance elements are a welcome change. The list of Audi SQ5 competitors is quite small and includes such models as the Mercedes-AMG GLC43 and the Porsche Macan S. The latter is, of course, a Volkswagen Group model as is the Audi. You can also consider the Jaguar F-Pace S.
A performance SUV is a natural complement to Audi’s RS models. The SQ5 clearly demonstrates that a high profile and strong performance are not mutually exclusive. You’ll pay the price to acquire one, but that shouldn’t surprise anyone looking for a luxury, performance SUV. 2018 Audi SQ5 photos copyright Auto Trends Magazine. All rights reserved.